The Polyscience Anti Griddle is for serious at home cooks / professionals. This is one major piece of equipment that not many people will need or use. But for the few that want the top of line equipment for the craziest recipes in Alinea, elBulli and Modernist Cuisine, this is the only model you should consider. 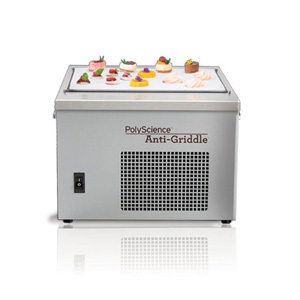 In fact, Polyscience developed the anti-Griddle for famed Alinea chef, Grant Achatz. The anti griddle flash freezes food through placing food on a plate that is -30°F / -34.4°C. This enables you to quickly take sauces, creams, mousses, or whatever you can imagine from liquid to a semi frozen or completely frozen treat with varying textures. Go from a thin crunchy shell on the outside to a creamy frozen interior in just seconds. The Polyscience website has several great videos that showcase all the product can do and how Achatz and even the Iron Chef’s of Food Network have used it. The machine is fairly large at around 16”x18”x11” and weighs 69 pounds. So you either need to have space for this to permanently sit in your kitchen or be prepared to lug it around when you need it. Polyscience doesn’t have direct sales from their site, so for the best price head over to here once you’ve decided to take the polar plunge.